Distance doesn't have to hinder success. Andrew Stalbow, CEO and Co-Founder at Seriously, shares his advice on how to build a unified company with headquarters across the globe. It’s 2014. After working at Rovio together for several years, Petri Jarvilehto and I launched a mobile entertainment company with dual headquarters. While offices in two places is not unique, our approach to it was. I stayed in Los Angeles to recruit the best creative talent from Hollywood to help us build our first brand, meanwhile Petri lead the office in Helsinki, Finland to procure the most creative mobile gaming talent. And just like that, Seriously was born and the world of Best Fiends was in blueprints. Four years later and still transcontinental, we’ve evolved into a company of 70 plus people who are building the Best Fiends brand. Even though long distance can have its way of taking a toll, our team has managed to cultivate a company culture that brings the best of both worlds – entertainment and mobile gaming – on two separate continents, together. We’ve created a unique secret sauce, that’s made from embracing everyone’s different qualities, backgrounds, and perspectives. With a connected world, it’s easy to have anyone anywhere working for a company, but getting a transcontinental culture right is a different story. Here are some things I’ve learned along the journey that can be applicable to companies with many offices or teams that work remotely. Maintaining a strong culture across any organization means maintaining a consistent objective. Often times, startups have trouble maintaining a balance between doing only a few things well and taking risks. For us, it’s ultimately about building value through the creation of our own intellectual property, and to achieve that, we need to be creative in everything that we do. It’s the small things that make a big difference from drawing our characters, producing animated short films, and even our marketing strategy. Since inception, our mantra is to focus on the long term value derived from caring passionately about the myriad of creative details that combined help us to build out a world. As essential as it is to have a set direction and goal, don’t get caught with tunnel vision. Be versatile in how you achieve your goals and adjust according to the market. What’s working in obtaining your goals and what isn’t? Be sure to communicate these hurdles with your entire company so everyone is still on the same page, and ultimately, buying into the same strategic direction. By making the focus of each office relative to where it is located, companies are able to utilize resources and insert themselves into local industry trends. For example, an office located in Los Angeles can prioritize storytelling through marketing and entertainment. 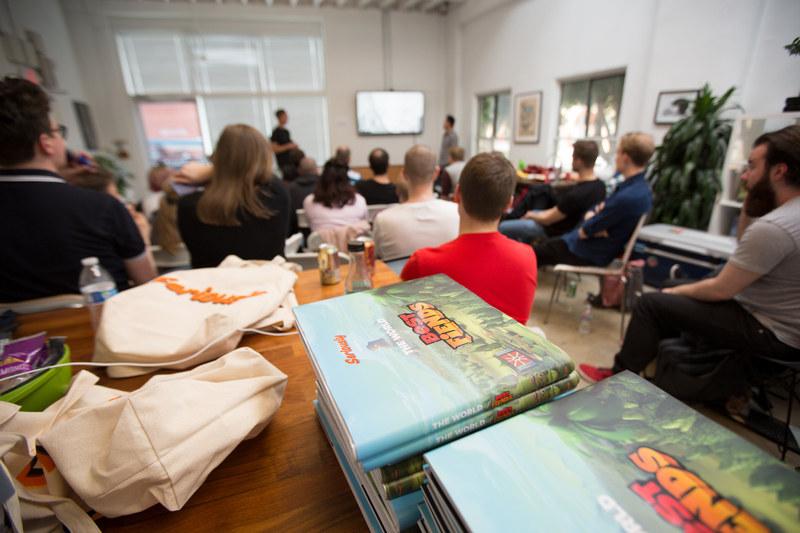 While an office in Helsinki can concentrate on creatively developing the mobile game, since Finland is a hotbed of mobile game development with companies like Supercell and Rovio nearby. For off-sites, we have found success leveraging the region’s specialty. We recently ran a weeklong workshop in Los Angeles where we spent a week delving into the creative process of writers, musicians, actors and each other, in the heartland of entertainment brands. Even though offices or individuals may specialize in their focus, it’s important to try to hire, or groom, the 9s and 10s, invest in the talent, and give them the ability to deliver. All teams, regardless of location, still need to work cross-functionally just like any company under one roof. What else can various cultures add to a project? How can you collaborate with other noncompetitive professionals in the region? Know that real-time feedback can sometimes be delayed due to time zones, so set expectations upfront. It’s no secret that communication is a key factor on any team, and although this seems obvious, it’s crucial to do so in the most efficient and effective way possible. It’s often difficult to communicate feedback and direction without face-to-face interaction, and not to mention adding different time zones to the challenge. Since working in two locations separated by a 10-hour time difference does not guarantee the luxury of in-person meetings, the time dedicated to calls with a remote team is even more valuable. We’ve found that both technology like HighFive and Slack, and team retreats have proven to be extremely successful in exposing all employees to new sides of the company and team bonding. In order to make the most of these moments, the team should come prepared with a comprehensive agenda and outstanding questions for each topic set to be discussed. How can you leverage technology to help these meetings? What else can you do in your agenda to facilitate collaboration and creativity? Success will come from keeping the team cohesive, productive, and innovative during critical meeting times. Two or more offices does not have to mean two different cultures. Petri and I have worked hard to create one company, one brand, with one passion, and one purpose. We speak about two hours a day through the morning, and prioritize alignment so that the team feels the consistency in our communication and set a good example for the team. Through hiring the right people and doing the right thing, we hope to create an environment where the team builds off of each other and grows into a cohesive brand. Andrew Stalbow is Co-Founder and CEO at Seriously, a company creating mobile games designed to be developed into entertainment properties. Seriously’s content development is based in Helsinki, Finland while the company’s business development and marketing functions are based in Venice, California. Seriously’s first property Best Fiends was released in October 2014 and since then, the game has been downloaded over 86 million times with up to 1.8 million daily active players. Formerly Executive Vice President, Strategic Partnerships at Rovio Entertainment, Andrew oversaw the company's commercial strategy and biggest partnership deals. Highlights at Rovio include the partnership with Lucasfilm for 'Angry Birds Star Wars' and building a video distribution channel within Rovio's 1.7 billion game downloads which has generated up to 250 million monthly views. Prior to Rovio, Stalbow ran 20th Century Fox's mobile division where he built new distribution channels for the studio's film and television properties worldwide. Highlights include working with the creative team at Gracie Films, and negotiating with Electronic Arts, to launch 'The Simpsons Tapped Out', a top grossing mobile game, and making James Cameron's 'Avatar' movie available as a pre-load as part of a launch marketing program for Samsung's Galaxy S smartphone.